ohmygosh what an adorable hotdog!! It makes you want to just eat him up! Awww, the video and pictures made me smile. Thanks for sharing! The hot dog costume is adorable! OK that is the cutest baby EVER! 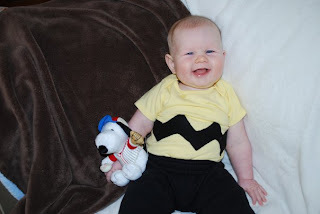 OMG the Charlie Brown in hilarious, what a cutie. ooh carmel is so pretty! hope you're having fun! Your laugh is so contagious! I just kept giggling whenever I heard you!! Fun!!! Have a wonderful vacation, I love Carmel - it is so quaint and gorgeous! Ohmygosh that gorilla video is hilarious!!! hahahah! And you laughing in the background makes me laugh too.. b/c I could only imagine that being my mom-I would have been DYING laughing! Nice one! Love it! And um.. new job?! New job?! Did I miss something?! More info!! Hope you're having a great time in Carmel! XOXO! I just found your blog and you are about the cutest little thing! I love a girl who posts her wedding shoes, and I would have posted those things too!! Adorable. 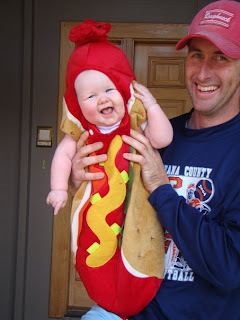 omg-That hotdog costume is the cutest costume I have ever seen. so so CUTE! Awh enjoy your little vacation...and that hotdog costume is the cutest thing i have EVER seen! Could your nephew be any cuter?? The singing gorilla is hysterical! hahah hot dog!! precious! have a great weekend beautiful! lucky lady! cute nephew, on vaca before a new job [that you still have not given details about!] and a hubs who takes good care of your mom on her birthday! lucky lucky lucky indeed! UMM that is HILARIOUS that your husband got your mom a birthday seranade - love it! That baby is precious! LOVE the hotdog costume!!! What a cute hot dog...love the singing gorilla...that is just F.U.N. your nephew is beyond adorable... i especially love him all stuffed into that hot dog bun! !